Contact your favourite travel agents to find out more. Win attractive prizes such as air tickets, iPad, TV and luggage bags. Sabre Travel Network (Brunei) Sdn. Bhd., in collaboration with Royal Brunei Airlines, Malaysia Airlines, Singapore Airlines and Ranoadidas.com, today (27 March 2019) launched the Sabre Sizzling Fare Promotion 2019. One week air fare promotion runs from 27 th March to 2 nd April 2019. Attractive fares to destinations serviced by Royal Brunei Airlines, Malaysia Airlines and Singapore Airlines can be obtained from one of the 23 locations of the 14 participating travel agents. “During the 2019 Sizzling Fare Promotion, travellers have the opportunity to shop from a wide selection of attractive fares to their favourite travel destinations and run the chance to win attractive prizes, including three return economy class air tickets to Kuching and Taipei sponsored by Royal Brunei Airlines, one return economy air ticket to any Singapore Airlines South East Asia destinations sponsored by Singapore Airlines, an Apple iPad Pro 9.7, a 32” television and Exclusive luggage bags,” said Irene Soon, General Manager, Sabre TN Brunei.“We thank our partners; Royal Brunei Airlines, Malaysia Airlines, Singapore Airlines, Ranoadidas and travel agents for their support and participation in this promotion”. 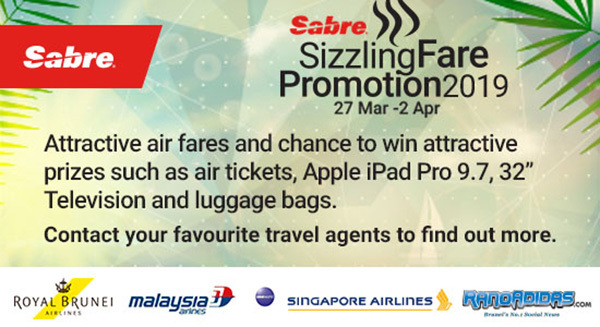 Travel agents participating in the 2019 Sabre Sizzling Fare Promotion include: Anthony Tours & Travel Agency, At-Taqwa Travel Tours, Century Travel Centre, Continental Yachting, Dar El Ehsan Travel, Darussalam Holdings, Freme Travel Services, Grace Travel Agency, Halim Tours & Travel, JJ Tour Service, Pan Bright Travel Service, Mas Sugara Travel Services, Southern Cross Travel Agencies and Straits Central Agencies.